Yucca treculeana, known variously as Spanish dagger, Spanish Bayonet, Don Quixote’s Lance, or Palmito, is a familiar sight in Texas. It begins life as a small, sharp-leaved shrub (see some examples here) but can grow to several feet in height while producing the large clusters of impressive, cream-colored flowers that draw people’s attention. As the plant grows, dead leaves collect and hang beneath the living. 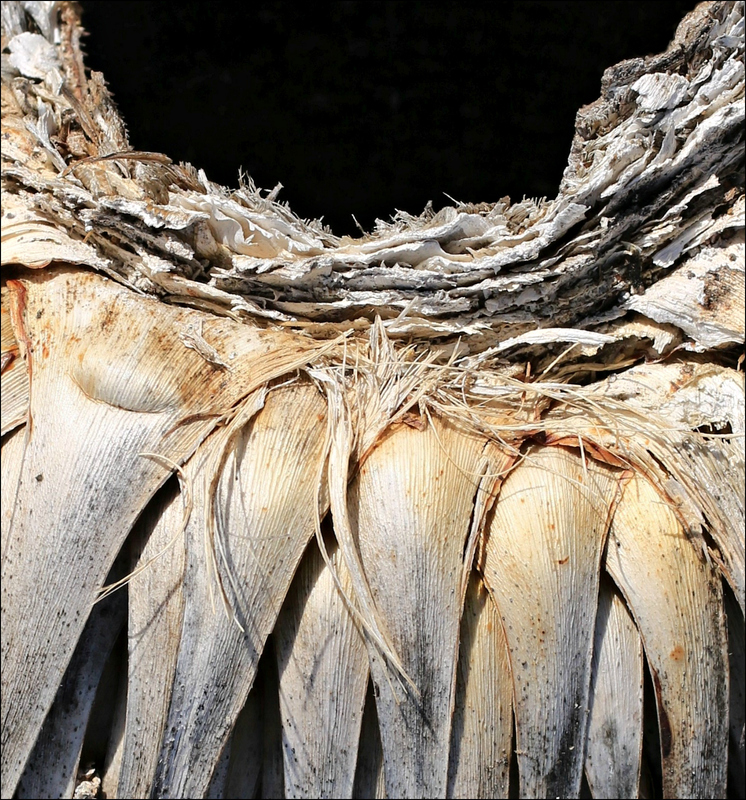 Occasionally, the weight of those leaves, combined with the death of the plant, will topple the yucca to the ground, where it offers shelter to nesting birds, refuge to various other creatures, and opportunities to a photographer. This one, on the Willow City Loop north of Fredericksburg, Texas, pleased me especially. Those leaves really do look like daggers. I’ll bet little kids enjoy playing pirate with them. The neighbor kids used my sharp holly leaves as weapons. I’m certain there are kids who’ve wielded them as weapons — at least once. They’re so sharp, even along the edges, a good stick seems like a better option. On the other hand, I’m not a ten-year old boy, and that makes a difference. Apparently riding a horse through yucca-land can be quite an experience, too. I agree, and I like the colors, too: nature’s black and white (with just a tinge of yellow and gold). There’s a similar plant, Yucca torreyi, that carries the name of botanist John Torrey. I just did a quick search to see if Charles Torrey Simpson might have been named for the botanist, but couldn’t find any information. Even if he wasn’t, it’s an interesting association. Those spiky leaves probably provide great protection against would-be thieves (or little ones seeking a hideout fort!) This isn’t a plant we see up here — thanks for capturing it for us! I don’t think any child would use one of these for a fort. They really are impenetrable, although they might be just slightly less dangerous than agaves. Anyone who works around them knows to wear leg and arm protection, and maybe even eye protection. A friend accidentally put the end of an agave into her eye while trimming plants, and it wasn’t pretty. She kept her vision, but the plant had to go. They are beautiful: no question about that. The biggest problem comes when people plant small ones, not realizing how large they’re going to become. The next thing they know, the sidewalks are impassable and the back door is blocked — that’s a whoops. I remember this one from the Arizona desert. Walking into a small one that might be hiding behind some brush or grass isn’t a pleasant experience, nor is trying to walk through a hillside full of them. Willing to live in scraggly rock cracks at times. On Valley Forge and Strawberry, you shred me with your spikes. We used to call them “shin daggers”. A perfect name, I’d say. Your pictures give a botanical example of the technical adjective imbricate. A new word! I’m sure I’ve never come across ‘imbricate,’ but it certainly has a lot of uses. 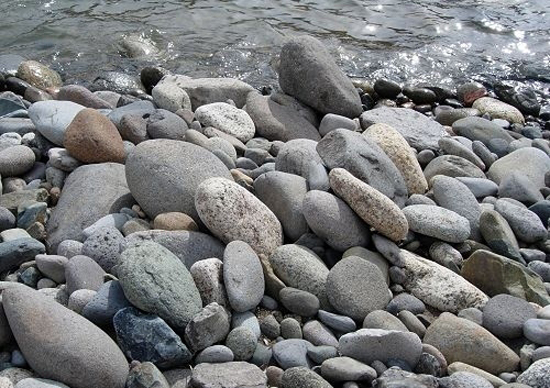 I found it even in geology, where there are such things as imbricated stones. Since I did see Howard Keel portray Don Quixote on stage, I think I like that name for it. His imagination would have definitely given him the idea that it was a lance. I don’t know if he ever found his way to the Pacific, but he was clearly admired for his dual roles as mechanic and entertainer wherever he went. I don’t think I ever knew that about him. Thank you. I not only always admired his voice, but also acting ability. I think that’s right. Learning to find beauty and interest in bits of nature that aren’t stereotypically ‘pretty’ is as much a learned skill as figuring out the camera settings: or so it seems to me. I like these photos, and I’m glad you do, too. The only thing that would have pleased me more would have been finding a bird nesting inside one of the yuccas. Maybe next time. 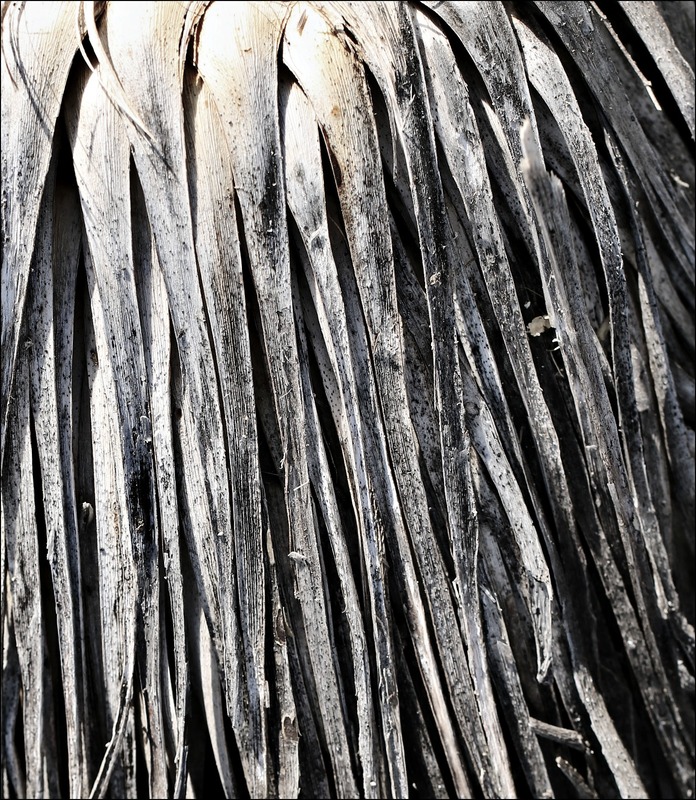 I like the geometry of these photos and their subjects–you captured the drama of the yucca well. There certainly is more to this yucca than the lovely flowers. I like seeing them in their native environment, where they aren’t trimmed within an inch of their lives and can age — and topple — gracefully. When I found this one on the ground, I thought the details were fascinating; I confess I’d never taken such a good look at them. I think seeing them at the end of their lives is similar to a tree that’s fallen, the multitudes of life that the relative giants host is remarkable. As for my own non-native to Texas yucca plants–I prune them. Ha! I tend to leave my two native ones, Y. pallida (Pale leaf yucca) and Y. rupicola (Twistleaf yucca) alone, they’re naturally tidier in the garden. I really do like the twistleaf yucca; I think it’s one of the nicest ones we have. As for fallen plants, I’m trying to make myself remember to take my camera to work with me, so I can stop along the way and see what’s up with a large century plant that’s toppled and is lying on the ground. It looks to me as though one of its branches still is getting nourishment — it looks green and fairly lively. But I’ll never know if I don’t stop! By the way, I found a large patch of your gaillardia blooming this weekend. Photos to follow, for sure! This is the sort of plant that very easily could become a landmark. When I saw them scattered along the cliffs on the Willow City loop, I was surprised to see how large they were. Left to their own devices, they can become remarkably tall — as yours proved. Apparently the life span is somewhere between 10-20 years. I suppose one that’s in optimal conditions might live a bit longer. This is really an interesting plant and a wonderful capture(s). I’ve never seen one of these before. The monochromatic scheme is really striking. I’ve never been overly fond of black and white photos, but I must say, this natural ‘black and white’ is really appealing. There’s just enough color to bring out the textures, which I think are fascinating. Apparently there are some varieties of yucca in Michigan, but this one isn’t native there, and probably wouldn’t do well. I did read that yuccas often were planted in Michigan cemeteries, so if you’re roaming around and see a deserty-looking plant among the graves, it might be yucca. I hope you don’t have to go outside for the next few days, unless you really, really want to. Be careful in that weather. I just looked at your forecast — not good. I saw a hula skirt, too. In fact, I’ve already decided that if I ever have to go to another costume party, I’m going as a yucca. Can’t you see that first photo as a scoop-necked blouse to go with the skirt? I just saw a note from NWS that the front will be here about 11 or so. I went out and watered the plants, and moved the schefflera out of the wind. No freezes here, it seems; I hope the northerners make it through without any real tragedies. Yes, definitely saw that shirt. Brisk wind this morning. We got a small bit of freezer burn on the scheff from the last round as it’s on the north edge, so I bundled the tropicals late yesterday. My first impression was of a sunflower. Then a pineapple. Now I know for sure what it is. I like both images, but am really taken by the textured curve of the first. It’s fascinating how certain patterns repeat through nature. I’d not thought of either a sunflower or a pineapple, but now I can see the relationship. It’s easy to miss when the plant’s still vertical. Then, all those hanging leaves just look messy, and the core that’s shown in that first photo is hidden by the leaves. I’m not sure what the center would look like when the plant’s still alive; I’ve not been brave enough to get close and explore it! Great, close-up details of a plant I know too well. It’s very common in the tropics. The dried-up leaves have fascinating patterns, similar to those of palm trees called ‘fronds’. As new fronds form, old ones fall off. Both Yuccas and palm trees need dying leaves to move nutrients from the older fronds to the new growth. That’s an interesting detail about the dying leaves helping to move nutrients; I didn’t know that. And I smiled at your remark about knowing the plant too well. Anyone who’s been around them for any time probably understands exactly what you’re talking about. At this stage in life, the plants are far more approachable. Your post took me back to my college days. Yucca was a rare plant in our part of the world then. I studied in a college run by carmalite nuns and one of the warden sisters had a yucca in her garden. It was her pride! We used to wait for the blooms to appear. I didn’t know that yucca is also called Don Quixote’s lance! Definitely a witty brain gave the name. Beautiful images, crisp and clear! The blooms certainly are beautiful. Last year was the first time I’d seen the buds. They’re equally elegant: so large and colorful. Don Quixote’s lance is a wonderful name, isn’t it? Of course, no matter whose name we give it, the lance-like quality of those leaves is clear if we run into one. I’m glad you enjoyed the images, and glad to have brought back some pleasant memories for you. I’ve noticed this phenomenon too, when I’m in the southwest, and it brings yet another opportunity to appreciate the absolutely endless beauty around us. I enjoy your botanical wanderings! These photos made me think of your work — which pleased me greatly. I suppose it was the abstraction, and the sort-of black and whiteness, and the slightly unusual composition. Now I can add birds nesting in dead yucca to birds nesting in saguaro to my bucket list — maybe some day I’ll see such a thing. Nicely done. I am in Costa Rica and the sheer profusion of palms and yuccas leaves me wishing I knew more about them. We have a palmetto just outside the door with a pair of Great-tailed Grackles incubating eggs in a nest at the crown. Great fun to watch the comings and goings. Thanks, David. It’s interesting to hear that the grackles there are nesting in a palmetto. They often build nests in the palms here, and the racket the young ones make in their treetop homes is remarkable. My copy of Linda Wires’s book about the cormorant arrived a couple of days ago. I’ve only read the preface and skimmed a few pages here and there, but the book that came to mind as I was reading was John McPhee’s The Control of Nature. I came to it during the Mississippi/Atchafalaya flood of some years ago, and I have a sense that some of the same issues underlying arguments over river control may appear in Wires’s book, as well as issues related to wildlife repopulation in the West. At least, it will be interesting to see if they do. Thanks for the recommendation. While working on the serious studies of birds, I sketched my view of four ‘sections’ of bamboo growing near my ‘perch’ by the lake. Half an hour into the study, I realized that this would not be as easy as thought.. and that night when painting, oh no – I needed to return to the site. Two days later and many hours of painting, I finished. Whew. I almost abandoned it but am glad I stuck with it – it’s strong. Boring but strong. Near the house one yucca soars to the sky, and many birds love the foliage, which stays very green. Band-backed wrens love to nest between the tangle of leaves…I will check tomorrow to see how much dead/dried foliage is there – vs the green. Will be off line until Monday or Tuesday. Stay warm – it looks like the worst weather is to your east? I laughed at your description of your piece as “boring but strong.” I’d love to hear more about that. Did the process of painting the bamboo come to bore you? I’ve sometimes trashed a draft because I realized it was boring me to death, and if it bored me, it surely would bore my readers. Or, were you unsatisfied with the piece when it was done? Perhaps it just didn’t have that little ‘spark’ that so many of your pieces have. I was surprised by how pleased I was with these photos. I’m not always fond of black and white, but the nearly-monochromatic tones seemed perfect to emphasize the lines. The first photo’s almost exactly as I remember it. I desaturated the second just a touch, and it helped to even out the light a bit. The weather here is fine, in the sense that not much is happening. It’s cool and cloudy, but slowly warming, and that means we have fog and more fog, and drizzle, in the forecast. I’m not pleased by that, but there’s nothing I can do except wait for things to change. At least we’re not waiting to celebrate temperatures rising above zero! There are times when I pause while painting – or before resuming a work in progress, and I think, “is this going to end as a dud? and if so, shouldn’t I stop now?’ — Usually there’s a stronger voice deep within which nudges me forward. Usually it’s that intrusive left brain that states, “This is boring, let’s go visit with the neighbors or go check on the flycatchers’ nest’ — so the right brain has to be dedicated and stronger — reminding me that it’s easy to throw in the towel and walk off the court — and commitment to a project often results in a job well done. The Bamboo is a great example.. I stuck with it, and even with raw edges and curled paper, it looks strong.. so with a proper mat and frame it will really shine. I pondered putting jaguar spots ‘behind’ it – instead of the stark white bristol paper… that would require another dozen or so hours – is it worth it? probably, but it will be best to leave that one as it is and explore the jaguar option in a new study. alas my jaguar reference photos are locked inside a dead computer! the humid forest is hard on electronics. i am in the cyber, where the owner is playing really really loud music videos…. i hope this made sense! It makes perfect sense. Your comment about the jaguar spots reminds me of the excised paragraphs I have hanging around. They get taken out because they just don’t fit, and it’s not worth trying to figure out how they could be made to fit. Instead, I just save them in my files. Sometimes they grow into something different, and sometimes they just linger. After a couple of years, if they’re still lingering — out they go! By that time, whatever moved me to think they were wonderful isn’t moving me anymore, and there’s no sense hanging on to the old when the new might be better. Its lines are striking. I’m not quite so quick to say, “Oh, that’s just an old, dead plant” any more. Like trees without leaves, plants like this often show off their structure in new ways. I was pleased with both of the photos. It was fun to work with line rather than color fpr a change. As for wildflowers, how about these?